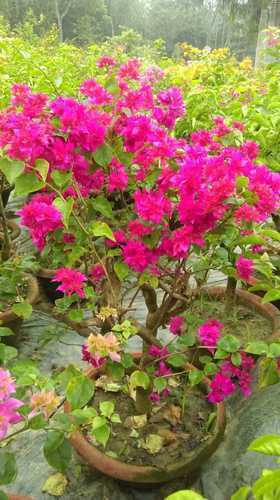 Our product range includes a wide range of Bougainvillea Flower, Musanda Flower, Pink Creeper Flowers, Yellow Butia Flower, Barlelia Flower and Creeper Flowers. Enriched with years of experience in the industry, we are engaged in offering Bougainvillea Flower. Owing to the rich industrial experience and expertise in this business, we are involved in providing a supreme quality array of Musanda Flower. The flowering plants (angiosperms), also known as Angiospermae Lindl. or Magnoliophyta, are the most diverse group of land plants. Angiosperms are seed-producing plants like the gymnosperms and can be distinguished from the gymnosperms by a series of synapomorphies (derived characteristics). These characteristics include flowers, endosperm within the seeds, and the production of fruits that contain the seeds. Etymologically, angiosperm means a plant that produces seeds within an enclosure; they are fruiting plants, although more commonly referred to as flowering plants. Average landscape size Twining stems quickly reach 15 to 25 ft. long. As an affluent name in this domain, we hold expertise in providing high quality Pink Creeper Flowers. In order to keep pace with never ending demands of the customers, our company is instrumental in presenting an excellent quality assortment of Yellow Butia Flower. Backed by our expert and experienced professionals, we provide Barlelia Flower. Speciality This is a fast growing ground cover that does well in sun to partial shad. We are a unique name in this industry to provide our prestigious clients an exclusive range of Creeper Flowers.